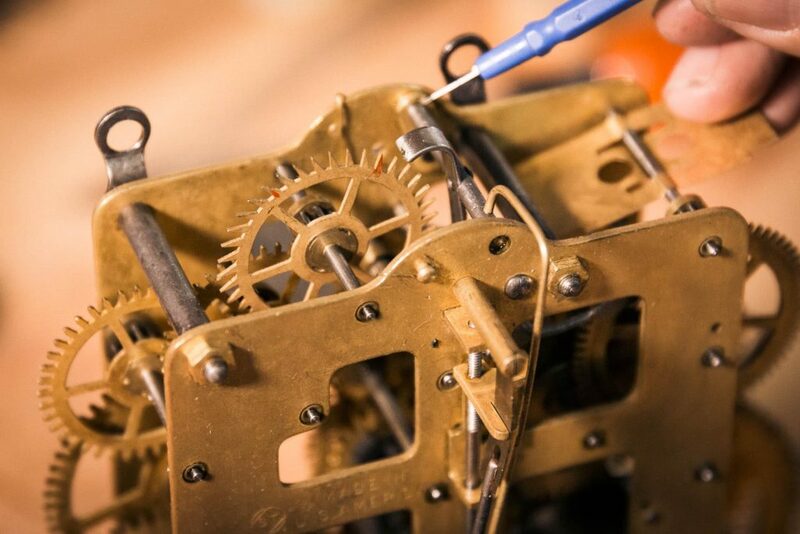 Our experienced clockmakers perform professional restoration and clock repair of all kinds of time pieces. We can also repair and service music boxes, metronomes, and other small mechanical items. Even if other clockmakers have not been able to help you, we are specially equipped to fix any mechanical movement and can even custom-machine antique parts and gears. Many problems simply require adjustment by an experienced clockmaker. We perform basic adjustments in our shop (often while you wait) or during a house calls. These repairs typically cost between $10 and $30. The movement in your clock should be oiled every four to six years. We remove the clock movement in order to oil the bushings, grease the mainsprings, regulate the pendulum, and perform other necessary adjustments. We use a high quality synthetic clock oil and a grease designed specifically for clock springs. There are over 100 points in a clock movement that need to be oiled! A full overhaul includes complete disassembly of the movement for cleaning and oiling, plus repair, and replacement of worn bushings, pivots, springs, and other parts. Cosmetic restoration can include silvering dials, polishing and lacquering brass parts, and even restoring clock cases. Our skilled clockmakers are experienced in the centuries-old profession of clock repair and can service any mechanical clock. Each overhaul comes with a two year guarantee. We can come to your home to service and adjust large clocks. We oil and grease the movement, level the case, set the clock in beat and make other necessary adjustments. If your clock has stopped after being moved, we can get it back up and running in no time! We carry specialized tools and many common spare parts in our van. We offer specialized moving services for large clocks than no moving company can provide. We transport your cherished heirlooms in a van that is customized for moving clocks, with specialized boxes and packing materials on hand. Each move includes service which is required to set the clock back in beat after transportation. It is a common myth that you can over-wind a clock. If your clock has stopped moving, it’s likely that your mainspring has become worn, dirty and/or dried up. This causes friction and makes it difficult or impossible for it to release power within the clock movement. Once your clock has been serviced or overhauled, you will be able to wind your clock without any problems. If you mainspring actually breaks, that is not your fault, but simply the result of a worn mainspring.